Hazle Ceramics was formed in 1990 by artist and founder Hazle Boyles. 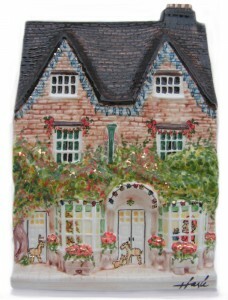 The company produce finely detailed ceramics of buildings from the British High Street. The main collection ‘A Nation of Shopkeepers’ takes its name from the famous Napolean quote. Hazle took the statement as a compliment and has produced a range of low relief miniatures that reflect many different periods of British Architecture and History: Edwardian, Victorian, Georgian, Elizabethan and Tudor. There is a large range of shops featured including a Chocolate Shop, Pet Shop, Fish & Chips Shop and Barbers. A number have been retired already and a secondary market is growing rapidly, with many of the early pieces being produced in low numbers. The company has been helped by winning the “best collectable” award and by bespoke commissions such as for Thomas Cook, and by the production of a number of successful limited editions such as Pet Shop at Christmas. Each model is hand painted and each is signed by Hazle, so no two models are ever exactly the same. Hazle actually changed her signature on January 1, 1992 so early signature pieces could become more sort after. The models are produced from liquid clay poured into the mould and turned out as greenware. The models are then fired to become bisqueware (biscuitware), and are then painted, and finally a white powdered glass is added which turns into a transparent varnish when fired. The Hazle Collectors Club ‘A Nation of Shopkeepers’ ran from 1994 to 2006 offered members a free gift, the chance to purchase club only pieces and subscription to the club jounal ‘High Street News’.